Superb setting, beautifully converted to the highest standard, Bishops is an ideal holiday for peace and tranquility in a unique/quirky grade II listed building but only a short drive to all the amenities and attractions this outstanding area provides. The chapel has a wood burner an Aga, and full central heating making it really cosy for those romantic winter breaks. The southfacing garden overlooks farmland and the west facing decking is delightful, you can watch the sun set and star gaze the unpolluted skies . The decking, patio and garden are all accessed directly from the lounge, double bedroom, bunk bedroom and kitchen. There are windows (some original) on all four aspects of the chapel and they ensure this is very light and airy building. All mod cons are provided for a comfortable stay, these include BT Vision TV, DVD player and a wide selection of DVDs, radio, CD player, docking station and CDs, free Wi-Fi access, children's and adult games and books. All linen, towels, heating and first basket of logs are included in the price. A fantabulous place to stay. A google search of Bishops chapel Cornwall, will bring up our reviews and more information if you need it. My husband and I live in Worcestershire. We have travelled extensively over the years both in England and abroad. We have a keen interest in character properties and that is the reason for buying Bishops. We would only buy properties we would live or holiday in ourselves and have high standards. Our love of the countryside is reflected in the situation of Bishops and our guests agree. 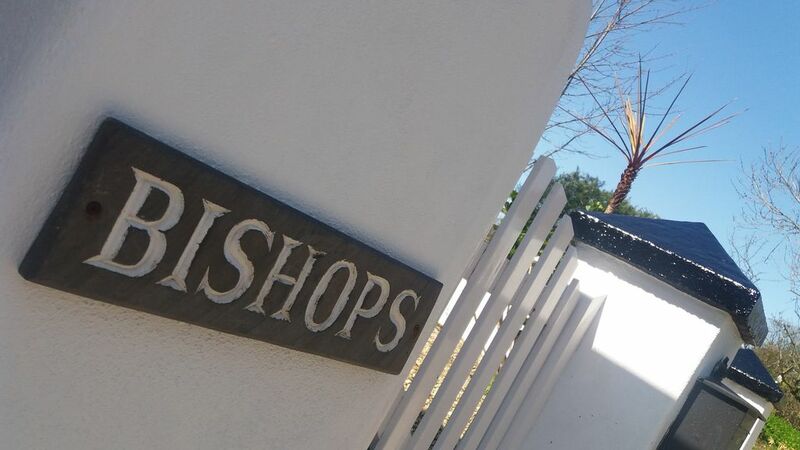 The biggest thrill we get is when our guests have enjoyed staying in Bishops as much as we do. This is not a contemporary soulless holiday home, with absent landlords, it is our family holiday home which we enjoy as often as work commitments allow. With all the comforts one expects for 21st century living but with many original features from the chapel still apparent. We had searched for a long time for that special holiday home in the right location. Having been sent by estate agents to many properties which just did not fulfill our criteria we knew this one was the one on the lane leading to it. The vendor was away but we wanted it without even going inside. It has that unique feeling to it which our guests seem to agree with when you read their comments in our visitors book. Only 6 miles from the nearest beach at Sandymouth, within walking distance of the Tamar Lakes and only 8 miles from the nearest large town at Bude but 2 1/2 miles to the nearest village Kilkhampton. Therefore an ideal location for a get away from it all holiday but with every activity and facility required for a holiday on your doorstep. Please see our many trip advisor reviews by searching holiday rentals, Bude, Cornwall. Complete tranquility and relaxation overlooking farmland on three sides of the property through some original windows. Although only 2 1/2 miles from a thriving village community and 8 miles from the town of bude. So peace and quiet but everything you need only minutes drive away. A sunny and protected patio area overlooks the south facing garden with a bbq and garden furniture. A wonderful wrap around decking area. All conveniences of modern living including wi-fi internet access for those who need to stay in touch with reality if needs be. Being an 1840 Wesleyan Chapel, it has a lot of original features which have been retained or used, such as windows, a roundel, some of the original wood and metal work from the chapel giving this holiday home a very unique charm with a very warm, cosy feel to it helped by the Aga and large woodburner, in the winter. Summer and winter sunshine reflects on every wall in the lounge area throughout the day reflecting the gothic windows. We are told by many guests that the photos do not do it justice. Some houses have that lovely homely feeling as soon as you walk in and we feel that is the case with Bishops chapel and so many guests have said the same. toilet, tub, shower, Underfloor heating. En-suite shower room off bunk room, with underfloor heating, shower, toilet and small hand basin. Large family bathroom, underfloor heating,, freestanding large shower, bath, WC, hand basin wall mounted ladder radiator. Original feature window. Oil central heating in addition to the wood burner and the electric Aga, so the chapel is a lovely warm cosy holiday let in the winter. Good quality fresh cotton bed linen. Large wood burner. The first basket of logs is provided. Parking for 2 cars. There is a driveway at the side of the chapel for 1 car and a pull in for a car next to the chapel. Free secure wi-fi available for guests. Good quality cotton towels and tea towels. Wood burner in the lounge and first basket of logs, kindling and firelighters supplied. Raised up from the kitchen, large living/dining room with 2 large leather sofas, dining table for 6 overlooking the kitchen area. TV, DVD player, DVD's CD/radio iPod docking station, scatter cushion, Wi-Fi. triple aspect over farmland and garden. Electric Aga. There are a couple of Aga cook books if you fancy trying something new whilst on holiday and there is a resume on how to use an Aga which is very simple. 4 slice toaster in addition to the Aga which can also toast, as can the microwave. Good quality utensils for all types of everyday cooking and plastic plates and glasses for the beach. Electric Aga, in addition to electric 2-ring hob, built in microwave, toaster, fridge, access to freezer, granite work tops, handmade bespoke kitchen, farmhouse round table and 4 chairs, washing machine. All utensils, pots and pans are of good quality. Although we have a 6 seater dining table and chairs in the lounge/diner, there is also a round farmhouse type table and 4 chairs in the kitchen area. Radio/CD player and docking station. A selection of children and adult dvds. A selection of board games for adults and children and also beach equipment for children. South facing lawned area, sun patio and west facing decking area. Bude Tourist Information provides details. Boat hire on the canal in Bude. A wrap around decking area accessed directly from the lounge and faces the west to watch the sun set and unpolluted night skies. An ideal place to sit in the late afternoon until sunset. A south facing patio and garden accessed directly from the kitchen, lounge, double bedroom and bunk bedroom. Ivy Leaf 9 hole golf club is about 4 miles away. Bude golf course 8 miles away, overlooking the sea. The famous Enodoc Golf Course at Rock is about 30 minutes drive away. For further information on all golf courses in the region the local tourist board can help. Due to it being a split level lounge/diner and unusual layout of the old chapel, this is not a wheelchair friendly holiday let sorry. Notes on accommodation: Fully centrally heated, the Aga also provides that wonderful homely warmth in the kitchen area plus a large wood burner in the lounge for those cosy winter breaks. The property is equipped with BT Vision which enables you to pause, record and catch up. The twin room has a 3 foot single which is raised off the ground by a step of about 12 inches, (see photos) and a 3 foot single with a memory foam mattress. The bunk bedroom is accessed directly from the double bedroom but also has its own en-suite shower room and a stable door leading into the garden thus giving complete privacy. The lounge/dining area and kitchen are split level with about 7 stairs to contend with. We are very competitively priced for what we offer. Our guest book is filled with the highest of compliments for the chapel and surrounding area. It is our family holiday home and we use it as much as it is possible therefore we have equipped it with everything one needs for every day living not just holidaying. Outside: A secluded south facing garden and sun patio accessed from the kitchen., main bedroom and bunk room doors providing a truly wonderful sun trap, even in the winter, with garden table and chairs, BBQ and parasol. There is a raised decking area accessed directly from the lounge on the west wall of the chapel to sit and watch the setting sun across the fields whilst sipping on a glass of your favourite tipple. An additional new off the road driveway has also been added. This is a very peaceful and private holiday let but within easy reach of so many wonderful tourist sites in both Devon and Cornwall. The north Cornish and Devon coast is on our doorstep, the A39 provide easy access to lots of famous Cornish and Devon seaside locations such as Padstow, Rock, Port Isaac, Crackington Haven, Bude, Clovelly, Bideford to name but a few. A 10 minute walk takes you from the door step of the chapel to Tamar Lakes and delightful footpaths in the area. No hidden nasties, the photos show the chapel as it is, no photo trickery or photoshop. Guests say the photos don't do it justice so come and see for yourself. Cleaning / Towels / Linen / Maid service: All bed linen, towels, tea towels, dish cloths, are provided and included in the price, they are changed once a week. All good quality linen. Other: The double bedroom, bathroom, bunk room and en-suite are situated in what used to be the old school house and has a quaint, historical charm. The hallway has the original bible cupboards. We have a high chair, cot and stair gate. Peaceful, rural, must have a car stunning home. Thank you for your review Pamela. So glad you enjoyed your stay. Hope to see you again soon. A lovely family holiday had by all staying in the beautiful 'Bishops Chapel.' The property was exceptionally clean and welcoming on arrival, just like a home from home. We had a Tesco delivery ordered for the day we arrived and shopped at local shops when needed. Comfortably slept 4 adults, 2 children and a baby. Facilities as described, and a cot and highchair was provided for our baby. Had a slight problem with hot water, but the manager was easily contacted and quickly rectified the issue. Lots of information in the property recommending beaches, local restaurants etc... one of which we ate in, the Bush Inn and had a lovely meal. We visited Bude Beach sea pool which the children had lots of fun in and spent a couple of days at Widemouth Beach body boarding and rock pooling. Would definately recommended to others and would love to go back in the future. Leanne, thank you so much for your lovely review, I am so glad you enjoyed your family holiday at Bishops chapel. I am sorry about the water problem but when I checked, the batteries in the wi-fi system that had been replaced were in fact faulty, so everything has now been changed and double checked so all good. We would love to welcome you back in the future. Lovely property, well equipped and clean. We had a lovely stay. Owner was very helpful when we had a few minor problems. Would definitely recommend. Thanks for your review Jim, I am so glad you enjoyed your stay at Bishops and perhaps can look forward to welcoming you back in the future. We had a lovely stay at Bishops. It is beautifully renovated with everything you need and more. It is in a peaceful setting but has so many things to do close by. Sally was very helpful, ensuring that our stay went well. The property was clean throughout and I would recommend it to family & friends. There are too many things to do to list them all, so I'll pick my favourites; Tamar Lakes, Sandymouth beach, Crackington Haven, Tamar otter sanctuary. Thank you for your lovely review Stuart. I am so glad you enjoyed your stay at Bishops and was able to see so much whilst you were in the area. You are welcome back anytime. This is an obviously well-loved converted chapel. The conversion has retained much of the original wood and fittings while providing thoroughly modern accommodation. The space is warm and comfortable. Highly recommended as a base for exploring Cornwall and Devon. Thank you for your wonderful review Charlotte, we are so glad you enjoyed your stay at Bishops and the surrounding area and hope the rest of your holiday was successful. A warm, cosy and very well equipped cottage. Bishops is warm, cosy and probably one of the best equipped cottages we have visited. The chapel is in a lovely rural location but still close to local attractions and amenities. As expected in February the weather wasn't brilliant, but the cottage was wonderfully warm, we loved having the wood burner as well although we didn't actually need it for heat. The kitchen was well equipped with everything we needed and my daughter and I enjoyed the experience of cooking on the Aga. The nearby Tamar lakes would be ideal in better weather, we did manage one decent walk around the upper one by the Dam. We also like the fact that so many of the original chapel features had been incorporated in the conversion and would happily recommend this cottage and hope to come back again. Thank you for your wonderful review. We are so glad you enjoyed your stay at Bishops and would love to welcome you back in the future. This area offers many interesting activities such as windsurfing, surfing, sailing, fishing, tennis, swimming, golf, coasteering, horse riding, biking, and much more. We have a magazine rack full of leaflets and information on the various activities you may wish to try and places to visit. The nearest beach is at Sandymouth 6 miles away, but there are many more wonderful beaches both pebble and sand in the area such as Widemouth, Northcott, Summerleaze, Welcombe, all within 10-20 minutes drive away. North Cornwall offers some of the best surfing beaches in the UK and together with large open expanses of sandy beaches, there is also the choice of the typical Cornish small inlets with fantastic scenery behind. From steep cliff faces to rolling green fields, variety is the word. Newquay airport is about 45 minutes drive away, Exeter airport is about 1 1/2 hours drive, Bristol about 2 hours drive. Obviously the larger international airports of Birmingham, London Heathrow, and Gatwick, and Manchester are further away but still within commuting distance. A car is essential for staying at Bishops. Kilkhampton is the nearest village from Bishops and this is only 2.5 miles away. It provides 2 convenience stores, a butchers, fish and chip shop, 2 pubs, and a toy shop. A farm shop offering fresh produce just outside the village. The village is dominated by the wonderful 15th century church of St James. Bude is 8 miles away offering everything one needs. Clovelly, Padstow, Rock, Bideford, are just a few of the towns and villages nearby. Many many more are within easy access from the chapel. Bude offers banks, post office, Morrisons, Sainsburys, Co-op supermarkets, fish mongers, Indian, English, Chinese and Thai Restaurants. A well established department store, clothes shops of all varieties, boutiques, Boots, Surf shops, hairdressers, butchers, and many more. There are some wonderful walks from the chapel doors. The Tamar Lakes, are 3/4 mile away, the Upper Lake providing water sports and a children summer activity school. There are walks around the lake and also a small campsite. The Lower Lake is a bird sanctuary and has a hide to watch the bird life from. Walks along the disused canal system all the way to Bude also starts here. The Tourist Information in Bude provides an array of information and leaflets about the local area and all the activities which are being held in the region although we also provide a substantial collection of up to date leaflets and maps in the chapel for our guests so you can start planning your holiday as soon as you arrive. Booking Notes: Please enquire for anything not stated, we can sometimes adjust our prices and dates to suit guests Once a firm enquiry is received, a booking form will be emailed to you for completion. A 25% deposit is required if the holiday is to be booked outside of 8 weeks otherwise full payment is required 8 weeks prior. A £100 security/good house keeping deposit is required in the unfortunate and rare event of breakages or the chapel is left is a very poor state. (Full terms and conditions outlined in our booking form). Changeover Day: Changeover day is Saturday during peak times but this can be flexible for short stays out of season. We do offer short breaks throughout the winter and low season. Contact the owner for offers and special deals. This website only offers a minimum of 4 night bookings out of season but if you need less please contact the owner as it may be possible . Notes on prices: Prices are for the property per week in UK Pounds. Please contact me for other dates, tariffs and short breaks. We may be able offer late booking discounts. We can sometimes be flexible out of peak season for number of nights booked.